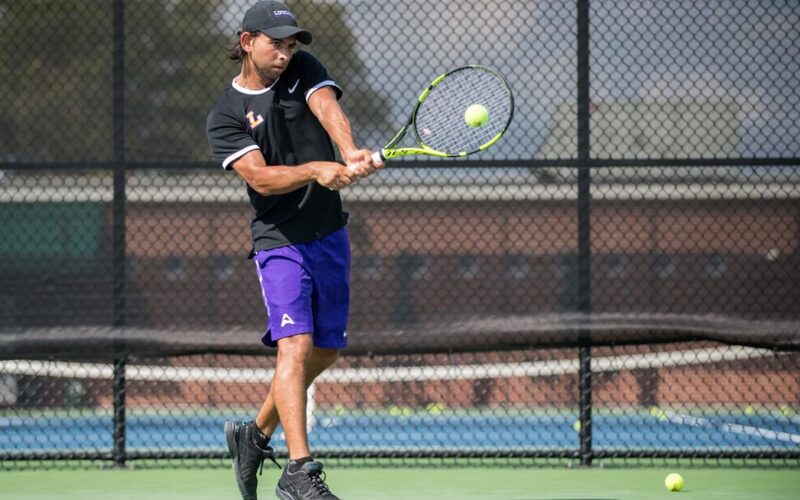 The Lipscomb men’s tennis team lost 6-1 against Grand Canyon University on Saturday night at the Richland Country Club’s tennis center. The night did not start off in favor of the Bisons (3-3) when they lost the doubles point 2-1 in just 30 minutes. In the No. 2 spot for doubles, Lipscomb’s Jorge Ortegon and Pedro Uribe lost their set 6-1 to Valentin Lang and Jakub Novak, while Lipscomb’s Jake Penny and Michael Tougher, on the third line, lost 6-2 to Lucas Grego and Freddie Grant. On the first line, the match between Bisons duo Victor Chaw and Pablo Caffarena and GCU’s Lorenzo Fucile and Mathieu Rajaonah was left unfinished. Losing the doubles point seemed to have impacted the Bisons as they played the rest of the night. “We tried to regroup and tried to get it going, but I think the energy was just a little too up and down today, so we just need to do a better job at maintaining that,” Hernandez said. In line four for Lipscomb was Uribe, and he lost both sets 6-0 and 6-2 to Grego, which placed the Bisons down at 2-0. Ortegon, playing third for the Bisons, also lost his sets 6-3 and 6-2 to Lang. The loss of this match led GCU to only needing one more singles point to take the win for the night. In the No. 1 spot, Lipscomb’s Chaw played a three-set match against GCU’s Fucile. Chaw won the first set 6-3 but lost 6-3 in the next two sets. Chaw’s face showed frustration when he realized this match had cost the Bisons’ chance of winning since it gave GCU its fourth and final point to bring home the victory. Although the Bisons had officially lost the night, the teams still played out the rest of their matches. Pablo Caffarena, playing in line two, was able to win the first point of the night for the Bisons in a three-set match against Rajaonah. Caffarena lost 6-3 in the beginning, but he continued to fight and came back, winning 7-5 and 6-4. The Bisons were now down at 4-1. However, the remaining Bisons on the fifth and sixth lines were unable to win any more points for Lipscomb. The Bisons’ Penny, in line five, lost to GCU’s Grant 7-6 and 6-2. In line six, David Skrabut lost to Novak 6-4 and 6-2 to end the game. “[GCU has] really talented players,” Lipscomb assistant coach Alejandro Manzanares said. “Most of them had really tricky games, and that affected a lot of our guys. “We’re used to good players that play the game kind of more straight-up, but they had games more about getting you off your rhythm, hitting more slices and switchy shots, which didn’t really help a lot of us. Lipscomb will play again at the Richland Country Club against UT Chattanooga next Friday, Feb. 15, at 6:30pm.